Colonel Aureliano Buendía’s last memory, facing the firing squad, was of a “distant afternoon when his father took him to discover ice”. It must have been March, for every year in March a family of gypsies, led by the legendary Melquíades, set up their tents near his village of Macondo. Aureliano must have been five at the time. Melquíades of the magnet, the telescope, the magnifying glass, the astrolabe, the sextant who brings with him the laboratory of an alchemist, cures and dreams and stories. Friend and accomplice of José ArcadioBuendía, father of Aureliano, Melquíades, after his second death, returns to Macondo a ghost, prolonging his presence as chronicler and mythical keeper of the family. As an exonym, ‘gypsy’ is no longer admissible and has been superseded by ‘Roma’ or ‘Romani’. But Bizet’s Carmen, Victor Hugo’s Esmeralda or Marquez’s Melquíades can only be ‘gypsies’; possessors of mystical powers, epitomes of love and passion, cord dancers, balancing somewhere between good and evil. Fugitive, survivor, wise and mysterious, a weaver of dreams and conjurer of magic, Melquíades and his gypsies are however not a travelling freak show. Nor are they a circus act. 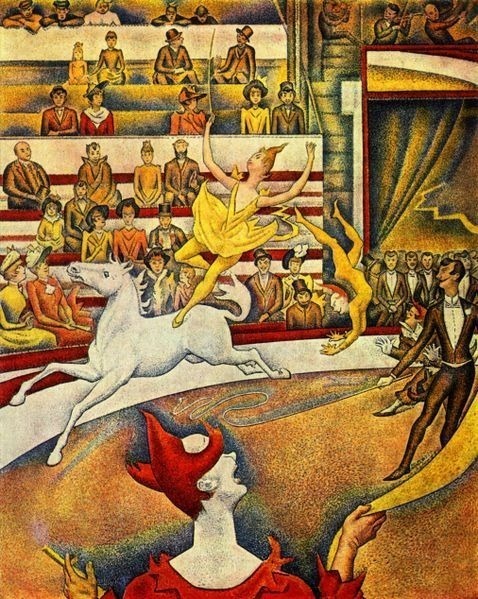 When Georges Seurat paints The Circus, he sets the stage for elegance and dynamism. 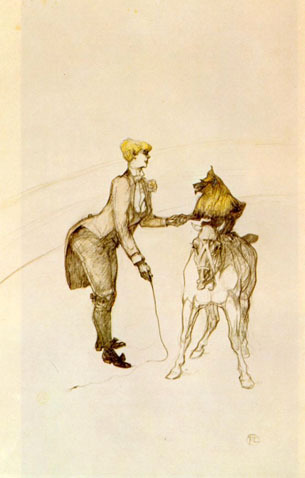 Affable clowns, a smartly dressed ring master and a young woman riding a wild white horse. A shame he did not do the same for the animals. I am not a member of PETA, FARM, COK or any other animal rights organization. I like entertainment. I like animals. I eat meat. I do not like abuse. I do not like wanton acts of violence. I do not like elephants in a parking lot. Il Circo Orfeo is in town and judging from their posters and website, this is a colourful event, not to be missed. Lo Spettacolo dei Campioni. It needs no translation. Clowns and horses and the Flying Martini, youngest trapezist in the world. Camels, lamas, zebras, a tiger and the ‘mitico elephante’ Darix! I have seen Darix. On the parking lot. For that is where he gets his daily outing. No savannah, no forest, no desert, no marshes. No room, no freedom. No bathing in water. Just the concrete parking lot. May in Bolzano and the circus sets up its tents. Last year’s protestors will again come and go. “Things have a life of their own,” Melquíades says when he first meets José Arcadio Buendía. Posted on 27 May 2015 27 May 2015 by MrsCalvo	This entry was posted in Popular Culture and Entertainment and tagged Circo Orfei, Georges Seurat, Gypsies, Henri de Toulouse-Lautrec, Melquiades, PETA. Bookmark the permalink.